The BJP president said this showed their party's strength as it was because of them that the bua-bhatija duo had to unite. 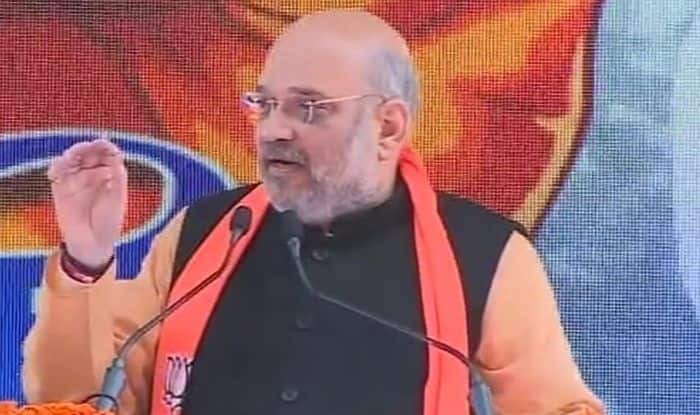 Dehradun: Bharatiya Janata Party (BJP) president Amit Shah on Saturday attacked the Samajwadi Party (SP) and Bahujan Samaj Party (BSP) alliance saying that those who did not look at each other’s face, have now come together to defeat the Modi-led government. “In Uttar Pradesh, arch-rivals (Mayawati-Akhilesh) have come together to fight us. It reflects how powerful we are. All these Gathbandhan people say Modi hataao and Modi says Gareebi hataao. These Gathbandhans and their leaders cannot do anything for the country. Neither will they be able to conduct surgical strikes,” Shah said. Shah also spoke on the controversial Ayodhya issue and asserted that Ram Mandir will be built. He further asked Congress president Rahul Gandhi to clear his stand on the issue. “Rahul Gandhi should clear his stand on Ayodhya. I can say without a doubt that Ram Mandir will be built there,” said Shah. BJP chief Amit Shah addressed booth workers during his visit to Dehradun to attend Trishakti Sammelan today. He addressed block and district level party workers of two Lok Sabha constituencies- Tehri and Haridwar.